Transporting and processing corrosive crude raise new questions about consequences. At least 3,000 kilometers (1,900 miles) separate the tar sands mines and processing plants of northern Alberta, Canada, from British Petroleum’s mammoth refinery here along the southern shore of Lake Michigan. BP is spending nearly $4 billion to expand and modernize its Whiting, Indiana refinery to process tar sands oil from Canada – an investment that has helped to make the Great Lakes Basin both a center of commerce in the two nations’ oil production boom and a target of rising environmental risks to the largest system of fresh surface water in the world. WHITING, Ind. — At least 3,000 kilometers (1,900 miles) separate the tar sands mines and processing plants of northern Alberta, Canada, from British Petroleum’s mammoth refinery here along the southern shore of Lake Michigan. But tying one of the world’s largest industrial zones in northwestern Canada to this Great Lakes industrial city is more than a growing network of pipes and pumps that transport raw fuel to be made into gasoline, diesel, and other products. The connection also is formed by billions of dollars in new investments in pipelines and refinery expansions in Indiana and Michigan. The massive spending — more than $US 6 billion since 2009 — has made the Great Lakes Basin both a center of commerce in the two nations’ oil production boom and a target of rising environmental risks to the largest system of fresh surface water in the world. In July 2010, a pipeline transporting tar sands oil ruptured near Battle Creek, Michigan, and dumped 1.2 million gallons of raw crude into the Kalamazoo River, just 128 kilometers (80 miles) from Lake Michigan. It was the worst oil spill ever in the Great Lakes Basin. A study four months later by the Michigan Department of Community Health found that in the days after the accident, 60 percent of Calhoun County residents who lived near the river experienced respiratory, gastrointestinal, or neurological symptoms. Now the Great Lakes region is focusing fresh attention on BP’s $US 3.8 billion project to modernize and expand the Whiting refinery so that it can process more tar sands oil. Liberating oil from Canada’s tar sands requires prodigious quantities of land, heat, fuel, and water. The new energy production zone has attracted the world’s largest fossil fuel companies, and produced a landscape that environmental organizations in Canada and the U.S. routinely describe as among the most scarred and polluted on Earth. It takes over two metric tons (4,400 pounds) of bitumen-saturated soil to produce a barrel of tar sands oil. The sands lie beneath boreal forests that are being cleared and scraped from existence. It takes four to six barrels (124 to 186 gallons) of water to produce one barrel of tar sands oil, which is four times more water than it takes to produce oil from conventional reserves, according to a 2009 study by Argonne National Laboratory. Much of that water needs to be heated, which requires over 1 billion cubic feet of natural gas annually. Meanwhile refining one barrel of fuel from bitumen takes two to three times as much water as producing fuel from conventional oil. Water to produce oil from tar sands comes from the Athabasca River, which runs through the northern Alberta mining district. The Alberta provincial government granted tar sands oil producers the license to withdraw 652 million cubic meters of river water annually—equal to 172 billion gallons—for mining and processing. Billions of gallons of wastewater form a slurry of sand, water, and chemicals that fill vast lakes called tailings ponds. The “ponds” cover twice the surface area of Manhattan, and will swell larger through at least 2062. From the air, tailing ponds have different colors, too—rainbow, aqua, wrinkled grey like the skin under a band-aid. In May 2008, 1,600 migrating ducks landed in one pond and drowned. Advocates say that the refinery is good news for the local economy, because it creates jobs and reduces U.S. dependence on imported fuels from unfriendly nations. But environmentalists assert the economic and consumer benefits are not worth the costs to either the local air and water, and in a broader perspective, to the Great Lakes Basin . Northeastern Alberta’s bitumen deposits rest beneath a stretch of Canada’s boreal forests and wetlands the size of Florida. In 2011, the tar sands were being excavated, heated, processed, and transported out of Canada at a rate of 1.5 million barrels of oil per day (BPD), according to Canadian oil trade associations. Of that, 1.1 million barrels were transported, principally by pipelines, to the U.S.
Bitumen, though, is pretty tough stuff to work with. Before it can be shipped by pipeline to become usable transportation fuel, bitumen must be processed at the mine sites and diluted with natural gas condensate, naphtha, or a mix of other light hydrocarbons and then transported to refineries that have the capacity to handle such heavy crude. 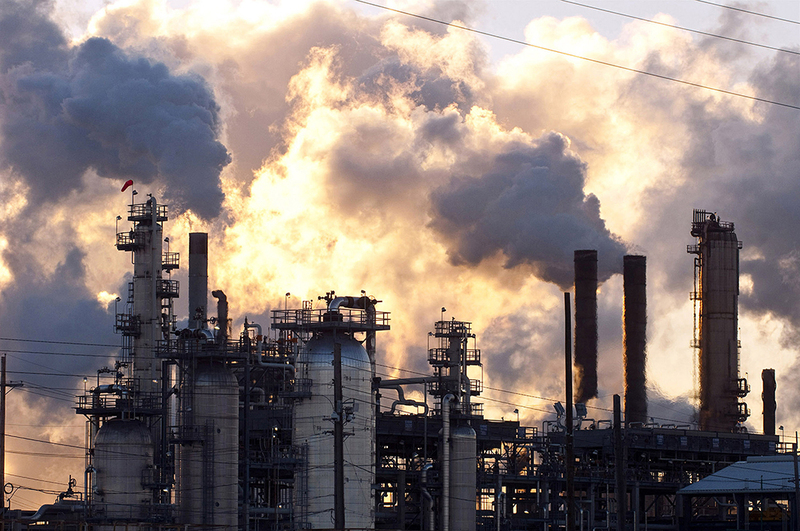 Canadian refineries are already operating at full capacity to harvest tar sands oil. The BP project is one of a number of refineries in the U.S. — fuel plants in Michigan, Illinois, Oklahoma, and Texas also are involved – that are spending a combined $US 23 billion to rework their equipment to accept tar sands crude. 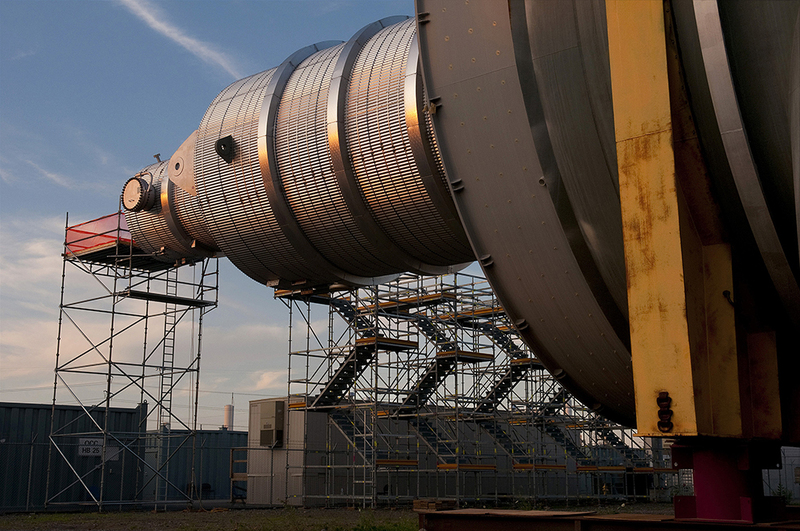 A crude distillation unit used to process heavy tar sands crude awaits installation. Sometime after 2013, when the refinery modernization is completed, BP executives said tar sands oil will be 90 percent of what the Whiting refinery will process. Though energy sector executives forecast a tar sands bonanza that will keep fuel prices in check and improve the nation’s security, environmentalists see a much darker picture. Along with consuming much more water than conventional crude (see sidebar) it also takes so much more energy to mine, heat, and process bitumen for fuel. Tar sands oil is estimated to release at least three times the greenhouse gas emissions per barrel of conventional crude, the National Energy Technology Laboratory projected in 2008. Approximately 30 percent of the oil currently processed at BP Whiting is a mixture of bitumen — the raw, jet-black hydrocarbon that saturates Canada’s tar sands — that has been diluted so that it could flow through pipes and across the border. Sometime after 2013, when the refinery modernization is completed, BP executives said the so-called “dilbit” will be 90 percent of what the Whiting refinery will process. BP’s switch to refining tar sands is expected to increase greenhouse gas emissions by 40 percent — equivalent to adding 320,000 cars to area roads, according to the Chicago Tribune. The plant’s upgrade will release significantly more nitrous oxides, sulfur dioxide, carbon monoxide, mercury, benzene, and lead into the air in northwest Indiana, a region that already suffers from poor air quality. The U.S. Environmental Protection Agency (EPA) warns that these emissions cause acid rain, smog, and major health issues like cardiovascular disease, lung damage, and premature deaths. Scientists say that many of the pollutants will also settle into the lake and eventually work their way into the human food chain through fish. The pollution produced by the BP refinery — already the sixth largest source of industrial pollution in the Chicago area, which is 29 kilometers (18 miles) away — is just part of the problem, say environmentalists. The other part is transporting dilbit into the region, as shown by the 2010 rupture in Michigan. The refinery's cracking towers and processing vessels rise like a giant steel curtain above surrounding neighborhoods and the Lake Michigan shoreline. The Whiting refinery, which dates from 1889, is the largest on the Great Lakes and seventh largest in the nation. It is capable of producing 405,000 barrels of fuel per day. The bitumen blends contain 15 to 20 times higher acid concentrations and five times as much sulfur as conventional crudes. Tar sands oil is up to 70 times more viscous than “sweet crude,” and those characteristics can weaken pipelines or make them more brittle. In addition, tar sands have been found to contain much higher quantities of abrasive quartz sand particles. 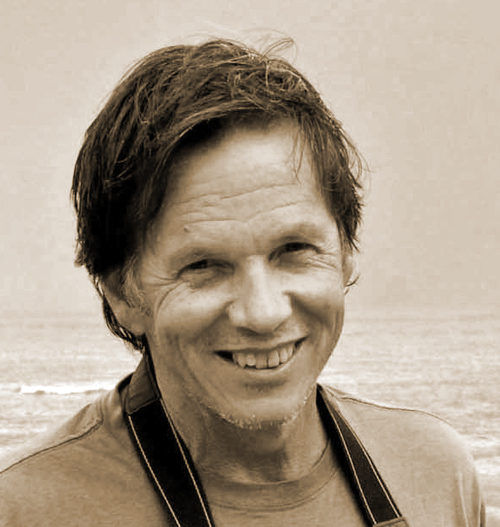 Lloyd DeGrane is a Chicago-based photographer whose work has appeared in the New York Times, Chicago Tribune, Chicago Reader, the Paris Match and other national and international publications. He specializes in location photography and portraiture. DeGrane’s black & white documentary work has been exhibited at the Chicago Cultural Center, the Chicago History Museum, and the Corcoran Gallery among others. There is solid evidence to be concerned. According to the NRDC study, Tar Sands Pipelines Safety Risks, the Alberta pipeline system, which has transported tar sands oil for years, has had approximately 16 times as many spills due to internal corrosion as the U.S. pipeline system, which only recently began transporting dilbit. From 2002 to 2010, Alberta’s hazardous liquid system experienced 218 spills that were greater than .61 barrels per 16,000 kilometers (26 gallons per 10,000 miles) of pipeline, the study found. That compared to 13.6 spills greater than .61 barrels per 16,000 kilometers (26 gallons per 10,000 miles) of pipeline in the U.S.
Alberta’s greater risk of leaks and spills has emerged even though over half of that province’s pipelines were built in the last 20 years. Meanwhile, America’s pipelines, on average, are twice as old yet leak less because they don’t transport dilbit. The Great Lakes appear to be vulnerable. Alberta tar sands dilbit arrives through the Alberta Clipper, a transcontinental 1,600-kilometer (1,000-mile), $US 1 billion pipeline that was completed in 2010 by Enbridge Inc., the big Canadian pipeline company that was responsible for the Kalamazoo River spill. 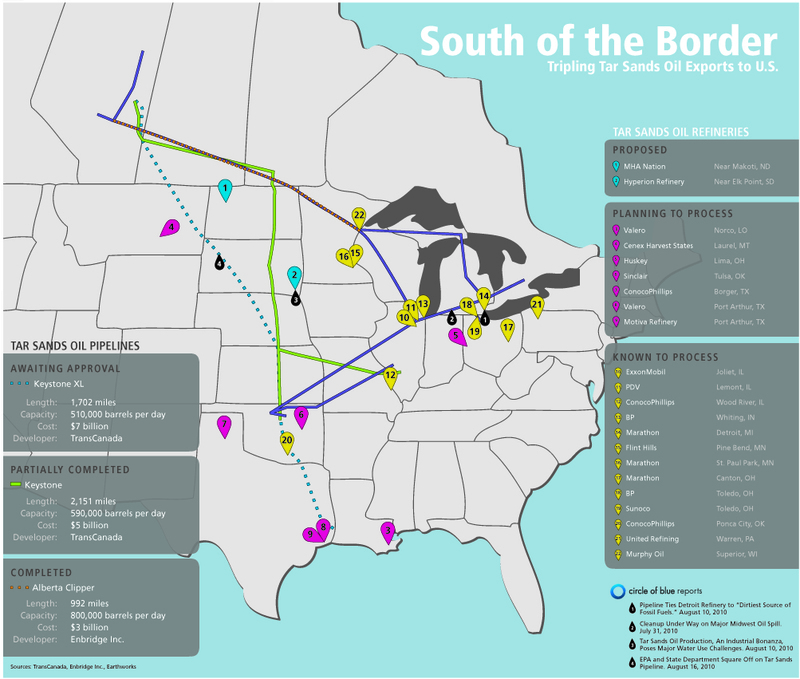 The Clipper runs southeast through Saskatchewan, Manitoba, Minnesota, Wisconsin, and the Chicago region, before feeding dilbit into the Enbridge Lakehead system that transports it through northwest Indiana and onward through southern Michigan to Detroit’s Marathon refinery. Looking south to Chicago, which sits just 29 kilometers (18 miles) northwest of the Whiting refinery. Because of its thickness, tar sands oil is pumped through pipelines at pressures of up to 101 kilograms per square centimeter (1,440 pounds per square inch, or psi) and temperatures of up to 70 degrees Celsius (158 degrees Fahrenheit), whereas conventional crude is typically pumped at ambient temperatures and lower pressures. Industry insiders assert that the rate of corrosion doubles with every 7 degree Celsius (20-degree Fahrenheit) increase in temperature. And at those high temperatures and pressures, the natural gas liquid condensate can change from liquid to gas form, which can create gas bubbles within the pipeline that release bursts of high pressure that can deform the pipeline. When liquid changes to gas in the pipeline, it creates a gas bubble that can stop the flow of oil — known as “column separation.” Workers are taught to treat column separations by pumping more oil through the pipeline. But actual leaks in the pipeline show the same signs as column separations, which means that a misdiagnosis can mean more oil being intentionally pumped into the ground, and water, rather than shutting off the supply. According to formal accident reports about the Kalamazoo River rupture and spill, the Enbridge pipeline in Michigan gushed for more than 12 hours before workers finally shut it down. Initial investigations indicated that the pipeline’s monitoring data had suggested a column separation, instead of an oil leak. Emergency responders were not notified until more than 19 hours after the spill began. Tar sands oil is more hazardous and difficult to clean up once a leak has occurred. The low flash point and high vapor pressure of the natural gas liquid condensate used to dilute dilbit increases the risk because the heavy crude can form an explosive mixture at any temperature above 0 degrees Fahrenheit. In addition, dilbit contains benzene, polycyclic aromatic hydrocarbons, and n-hexane, all of which can affect the human central nervous system. While the EPA describes mechanical devices such as booms, skimmers and sorbent materials as the primary line of defense against waterborne oil spills, dilbit is heavier than water and requires significantly more dredging than a conventional oil spill would. The cleanup of the Kalamazoo River spill ultimately required more than 2,000 personnel, over 4,600 meters (15,000 feet) of boom, 175 spill response trucks, 43 boats and 48 oil skimmers. In Whiting, most residents join BP executives in their view that the risks of transporting tar sands oil are low, and the value of the modernized refinery is high. From Interstate 90, it is easy to see why the BP refinery, which is two-thirds of the way through the expansion, is Whiting’s main industrial attraction. Its cracking towers and processing vessels rise like a giant steel curtain above surrounding neighborhoods and the shoreline. The refinery, which dates from 1889, is the largest on the Great Lakes and seventh largest in the nation. It is capable of producing 405,000 barrels of fuel per day. BP Whiting, in short, is a community mainstay. The refinery accounts for approximately half of the local tax base, employs 5,000 construction workers to expand the refinery, and promises 80 to 100 more full-time positions once the expansion is complete in 2013. 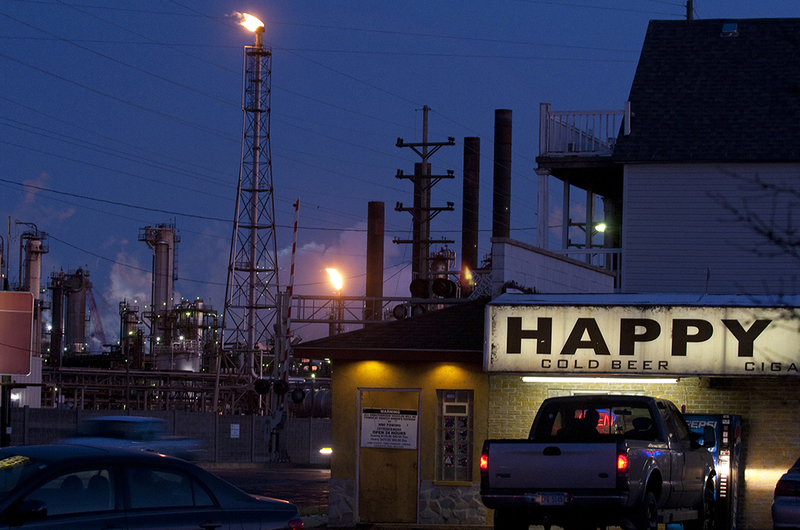 Thousands of BP employees support Whiting’s businesses, including Happy Jack's Liquors. "That that has been a very significant benefit for the downtown economy," said Brian Lowry, a member of the Whiting Redevelopment Commission. For these reasons and more, BP’s modernization project has attracted considerable attention from business executives, government leaders, and environmental advocates. 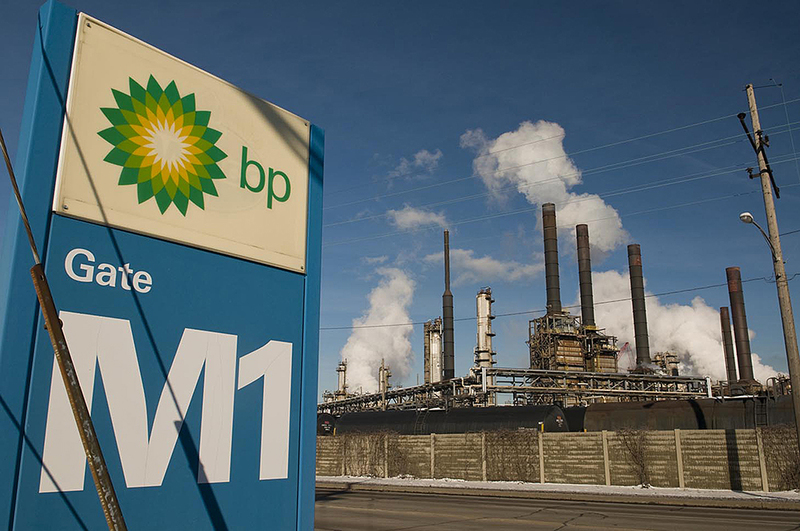 On the business side, the expanded refinery will yield three times the profits, according to BP executives. In Detroit, Marathon Oil executives who are completing the $US 2 billion modernization of their refinery in Michigan’s largest city have expressed similar predictions about profitability. If the projections turn out to be accurate, it could significantly influence strategic decisions for the three other existing refineries on Lake Superior, Lake Huron, and Lake Erie. BP’s expensive upgrade for the Whiting refinery includes a new petroleum coker — which heats heavier residual products, such as asphalt, into lighter fuels like gasoline and diesel. BP says the new coker will produce 15 percent more motor fuels. The upgrade also will install a crude-distillation unit, a gas-oil hydrotreater, sulfur-recovery facilities, and, BP says, a modernized wastewater-treatment facility. This and other equipment, say executives, will limit air and water pollution from the plant. BP executives in Indiana have worked hard to win over Whiting and the neighboring town of Hammond, which sit just 29 kilometers (18 miles) southeast of Chicago. 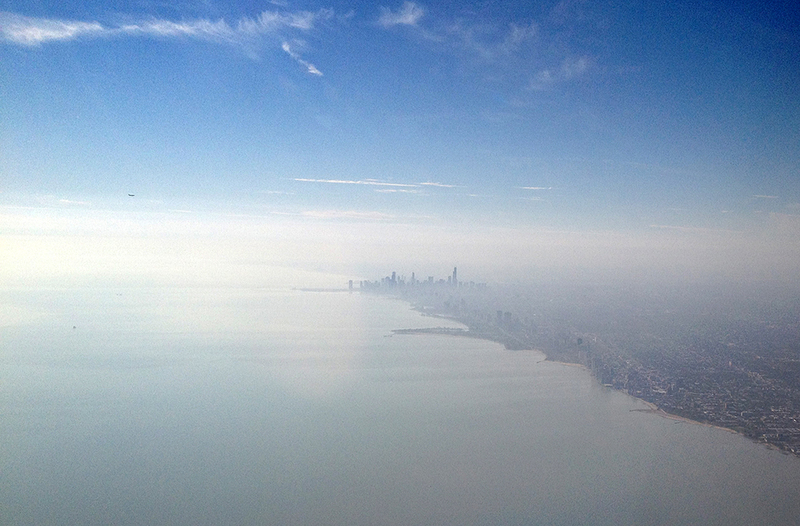 Even on a smoggy day, the Windy City skyline appears in the distance. In a visit to Chicago in January, Bob Dudley, BP’s chairman, described the Whiting refinery modernization as a very high priority that would add to the company’s revenue, and told reporters it was part of a national and global program to “restore the public’s trust” in the aftermath of the Deepwater Horizon spill in the Gulf two years ago. Dudley’s words resonated in Indiana, where the refinery modernization is the largest and most expensive industrial project in state history, according to BP. Despite the decline of the local steel industry after its peak during the World War II, Whiting still looks like a proud small town, in the heart of midwestern America, with its ball fields and playgrounds, patriotic flags, packed breakfast diners, and main street shops. BP’s switch to refining tar sands is expected to increase greenhouse gas emissions by 40 percent — equivalent to adding 320,000 cars to area roads. BP, a generous employer, has delved into local philanthropy. The company gives each employee $US 300 to donate to the nonprofit of their choice, provides local education and job training, offers pre-apprentice training to minorities and job demonstrations at local high schools, and funds the Indiana Dunes Environmental Learning Center. 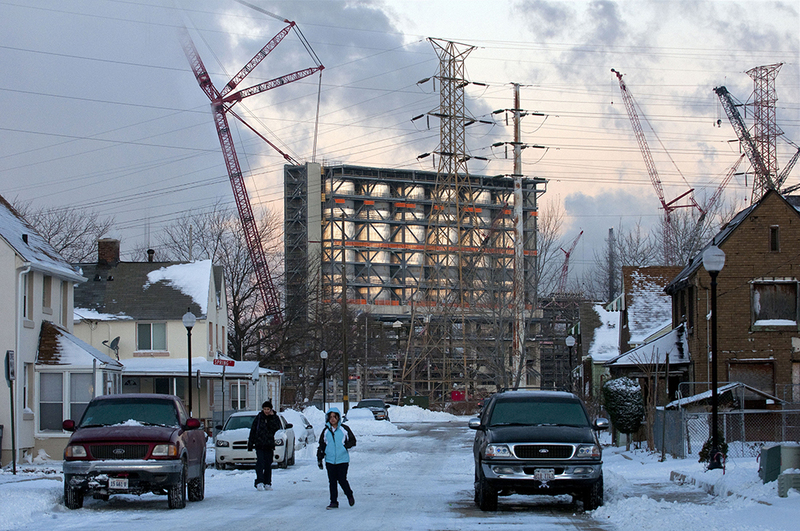 Suffice to say, the massive oil company and job provider enjoys broad local support. But not among everyone. Sixty-three-year-old Steve Kozel, who was seven when the Standard Oil refinery exploded in 1955 and nearly took Whiting with it, is worried about what the refining of mostly tar sands will do to northwestern Indiana and the local air and water — especially in the case of an explosion or oil spill. Kozel is president of a citizens group called the Calumet Project, which has teamed up with national environmental groups to force BP to limit the effects of its expansion. Chicago leaders, including former mayor Richard Daley and current mayor Rahm Emmanuel, raised an outcry in 2007 when Indiana first granted BP the right to increase the amount of ammonia and sludge that it would release into Lake Michigan. BP then backtracked and promised not to increase the limits of its previous permit. Environmental activists are also worried about the presence of the volatile natural gas that is used in dilbit. Carolyn Marsh, who helped establish a bird sanctuary in Whiting, fears that it could lead to another explosion. BP burns off that gas through flaring, which shoots flames into the sky and increases air pollution. BP’s air emissions also include sulfur dioxide, benzene, lead and other pollutants linked to respiratory disease and cancer. Jacob Wheeler writes from Minneapolis. Reach him at jacob.wheeler@theuptake.org. Funding for Circle of Blue reporting on Great Lakes and energy issues is made possible by the C.S. Mott Foundation.